Maxi, our lovable pet and faithful companion! 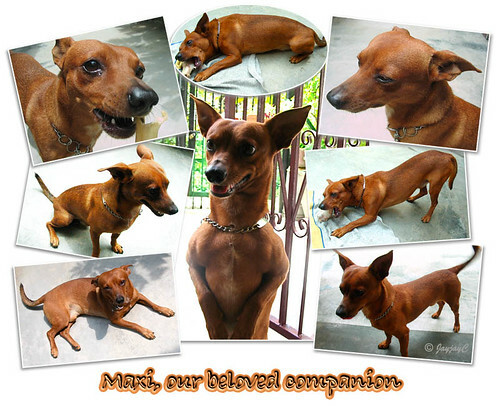 For a change, we’ll start off the New Year 2010 with a post on our affectionate miniature pinscher, Maxi, whose lovable ways have never failed to uplift our spirits everyday! Like our garden plants and flowers, he provides us countless delights and pleasures, yet different from plants, in that we can interact and communicate with one another so playfully and joyfully that he is reckoned as an additional member to the family. Showcasing in the above collage are precious shots of Maxi, captured last October 1, on his 5th birthday. A toy breed weighing 6 kg, who is slightly too heavy for his own good, according to the vet. Haha…food seems to be his paramount passion! With his home located just outside our kitchen, it’s inevitable that he’s seemingly hungry all the time! We spoil him crazy, sharing bits and pieces of what we’re eating, except chocolates which are known to be poisonous to dogs. Omelette, biscuits, cakes, and crunchy items like apples, pears and turnip are some of his cravings, to name a few. 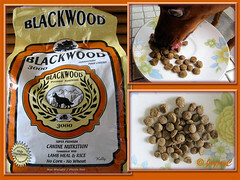 But of course, his one-meal per day, dinner-plate of Blackwood 3000 dog food (lamb+rice), plus freshly-cooked rice, chicken fillet and soup tops his list of favourites. Somehow, he can sense his dinner-time. You can really see him smile, gaze longingly, stand on tippy toes or jump joyfully as he awaits for his beloved master to prepare his dinner. He can gobble all down within 2.5 mins and take in more if given…John says a dog never knows when enough is enough, haha! 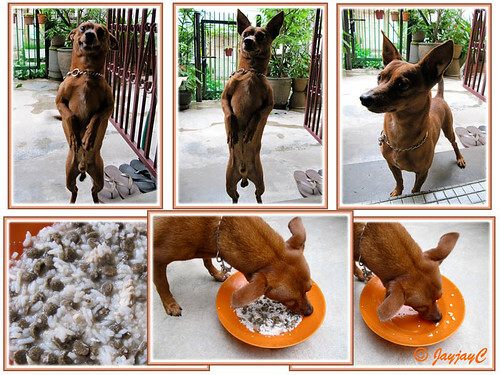 As characteristic of the Miniature Pinscher, Maxi, our cross-bred Min Pin is very energetic, playful and fun-loving. Fortunately, the whole fenced-backyard, next to the kitchen, is all his for the taking, an area measuring 22 x 9 feet, with more than ample space for him to run around in and exercise. 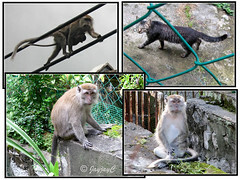 Stray cats and wild monkeys on the prowl ever so frequently outside our backyard, on ground or high up on telephone cables and roof tops really keep him on his toes! Always alert and inquisitive, he keeps himself busy all day long. Especially the monkeys, that come singly or in groups of 3-6 as a family truly rile him up, causing a ruckus with his nonstop barking until they’re out of sight! 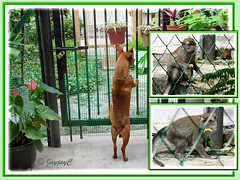 Though a toy breed, he can appear formidable with his constantly sharp and loud barking when facing the monkey’s growl. Appears challenging and brave, probably because he feels safe in an enclosed compound but he’s definitely no match for the wild and aggressive monkeys, the larger ones especially! We were surprised to find out recently that too much barking over extended periods can even weaken or make him appear unwell. He’s such a joy and wonderful addition to the family. Taken in as a pet, slightly more than 4 years ago, Maxi is such a loyal and faithful companion, loving, charming and so easy and inexpensive to maintain. A little tender loving care and a playmate or two is all he ask and he has rewarded us handsomely, more than a hundredfold and it keeps adding! Amazingly, he’s still able to recognize my sis (his previous owner) and daughter even after a long lapse of time, almost a year apart between visits. The saying that a dog is a man’s best friend is so true! Thank you, darling Maxi! We love you so much! Big hugs and kisses from Daddy and Mummy! Too bad, our Maxi can’t respond by saying, “I love you”! Simply amazing … a husky dog did say that on YouTube…so cute, you’ll surely love this! 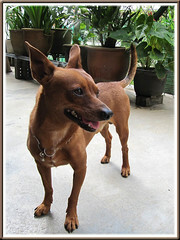 Read more on Miniature Pinscher at wikipedia. hehe, hopefully i got it now! Thank you very much. I can fully relate to your post as we have 1 dog, 3 cats with 5 kittens, 1 guinea pig, my sister has 5 dogs. Besides, we also have native chickens and 3 goats. Does it sound complicated enough. They don’t get that much food as your Maxi though, pity them. I realized monkeys are allowed roaming in Malaysia because we saw a group of monkey family at the playground of UKM. There are also lots of them dangling at the nearby trees. At least in Siem Reap, Cambodia they are really near the forest. In your case are they not harmful to plants or children? Our ways with Nature’s gentleness! Jacqueline, May you and John share many many more joy and laughter with Maxi. Andrea – you’ve got it right this time…good for you! Wow, I’m amazed…I can just picture how wonderful it must be living where you are, sort of a farm or countryside with fresh air and surrounded with nature, right? Unlike our urban dwelling that is rather polluted, with lots of forests depleted in the name of development. Hence, wild monkeys are forced out to hunt or forage for food…how pitiful! We’re safe as long as we do not antagonize the monkeys and our faithful sentinel, Maxi is around to ward them off our backyard. Autumn Belle – Ooohh…I just love the inclusion of your lovely poem here! Thank you and thanks too for your kind thoughts and wishes.